Studies show that selenium, a trace mineral, is an important common denominator among some of the world's longest-living people. Selenium promotes heart health, brain health, and supports longevity. 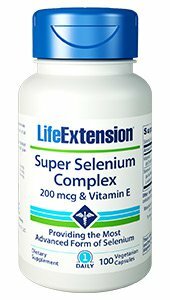 And our Super Selenium Complex formula provides three unique forms of selenium along with vitamin E for optimal health and longevity support. Three forms of selenium + vitamin E. Each form of selenium acts along a different pathway to support healthy cell division. For optimized selenium support, one should supplement with all three forms of selenium. Super Selenium Complex delivers sodium selenite, L-selenomethionine, and selenium-methyl L-selenocysteine. Super Selenium Complex also contains a small amount of vitamin E because it has been shown to work synergistically with selenium. Antioxidant, thyroid, and immune support. Selenium is also an important factor when it comes to its ability to fight oxidative damage one of the primary causes of premature aging. That's because the body utilizes selenium to make glutathione peroxidase, an endogenous antioxidant enzyme. Selenium also supports normal thyroid and immune function in healthy individuals. Cardiovascular health, brain health, and healthy cell division, Selenium plays a role in healthy cell division. But its ability to promote a healthy inflammatory response and quench free radicals has led scientists to explore its beneficial effects in regard to other conditions involving oxidative damage, particularly for heart and brain health. Selenium is a vital nutrient for healthy cell division. It also protects against oxidative stress, promotes heart and brain health, and may be key to promoting longevity. DIRECTIONS: Take one (1) capsule per day with food, or as recommended by your healthcare practitioner.